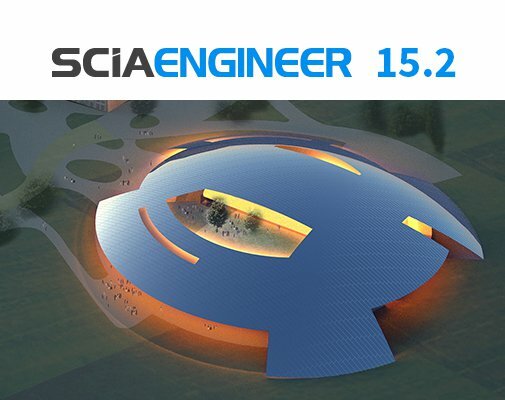 SCIA Engineer 15.2 expands the program’s steel and concrete design capabilities with a special focus on the United States and provides numerous usability improvements to increase the day-to-day productivity. Initially introduced in SCIA Engineer 15.0, the design module for composite beams according to EN1994 has been greatly extended with: automatic effective width calculation to the code, lateral torsional buckling checks, shear connector design and fire resistance design. Design of steel connections now fully supports beam flanges and webs in compression according to EN 1993-1-8 Article 6.2.6.7 (1-2). Other improvements concern summary output, output for splice connections, and drawing of connections in the 3D model. For fast and easily verifiable seismic analysis, SCIA Engineer 15.2 introduces the Equivalent Lateral Force procedure including support for the provisions of ASCE 7 and EN1998. This simplified method is a nice complement to SCIA Engineer’s current seismic analysis capabilities. The new virtual joist component in SCIA Engineer allows the engineer to incorporate joist member stiffness in the overall model, making the analysis of the building system more accurate. The joist members can be checked to AISC and auto-designed and are given a realistic joist designation consistent with expectations from joist manufacturers and the Steel Joists Institute (SJI). Materials databases have been expanded to include timber and aluminium according to IBC. Users will find a new prestressed tendon library according to standards ASTM A416 and ASTM A910. This development enables users to introduce strand-patterns and tendons in 3D beam and slab geometry while providing the ability to calculate losses. Inputs, filtering, and the viewing and exporting of results have been improved in both the Table views and the Engineering Report. In addition, the Engineer Report offers some nice PDF and MS Excel compatibility improvements. SCIA Engineer 15.2 presents better convergence in the calculation of membrane structures using triangular finite elements. After an elasto-plastic analysis of steel plates and shells, the user can now display the strains and plastic strains on the 3D model.